I am a passionate teacher in Oregon, Wisconsin, USA, who has taught 4th, 5th, and 7th grade. Proud techy geek, and mass consumer of incredible books. Creator of the Global Read Aloud Project, Co-founder of EdCamp MadWI, and believer in all children. I have no awards or accolades except for the lightbulbs that go off in my students’ heads every day. First book “Passionate Learners – Giving Our Classrooms Back to Our Students” can be purchased now. Second book“Empowered Schools, Empowered Students – Creating Connected and Invested Learners” is out now from Corwin Press. Follow me on Twitter @PernilleRipp. Today the temperature hit 78 degrees. 78 glorious sunny degrees meant a day filled with ice cream, water fights, a nap in my hammock, and as many doors and windows open as possible. With this little taste of summer, my own kids naturally wondered when the days of summer would truly be here. Days filled with sleeping in, popsicles, trips to the pool and, of course, days spent reading. Reading whenever and whatever we would like. Reading aloud. Reading by ourselves. Listening to audiobooks as we travel. Heading to the library as often as we need, simply because we can. May every child have this type of summer ahead. Yet, we know that for many children, summers do not mean days of glorious reading experience. Typically a third of my own 7th graders reveal that they never read a book in the summer, another third say they read one or so. This is despite the amazing reading experiences they have in the years before us. This is despite the amazing community support we have. We know the research on summer slide, such as what is compiled here by the Colorado Department of Education, and how important continuing to read is over break in order for students to continue to grow. So what can we do with the last few weeks upon us as we try to entice the kids to read once they are away from school? How can we ensure they still have access to great books and the motivation to read something? Here are a few ideas and feel free to add your own in the comments. We can up our book recommendations. Now is the time to really amp up how many books we book talk in class. While students will also be recommending, we make it a point to recommend at least one or two books a day until the end for students to put on their to-be-read lists. With 35 teaching days left, that is at least 35 invitations to an incredible book. Students can share their favorite read of the year through a speech. Another way to increase the titles on their to-be-read lists (a list that they created in the first week of school and which has been a central gathering place for their book ideas all year) is by doing a best book of the year speech. While last year we did it as a 15 word speech, this year we may revert to the past way of having them do it in a minute – they share a teaser to the book and why they recommend it. Behind them is a slide with the cover so their classmates (and me!) can write down the title recommendations. To see their favorite books from previous years, go here. Our libraries can have summer check out. We have a beautiful school library with an amazing librarian and a library aide and they do summer check out every year. A few times before the end of the school year, they have extended after school hours with the sole purpose of having students check out books for over the summer. In the past, they have also had the library open a few times during the summer so students could come in and exchange books. Because not all of our students have many access points to book, this is a vital component in summer reading. I know not every child has a home flooded with books like my own, this is why it is so important we make books accessible to all kids without needing transportation or money to get them. We can have our public library librarian come in. Every year, the librarian from our public library comes in to share what they will be doing over the summer as well as give library card recommendations. Partnering with your public library is another way to show the value of it and having them come in and speak to students reminds them of this wonderful opportunity. We can read aloud the first chapter. Sometimes it takes more than a brief book talk to entice and so another great way is to read aloud the first chapter of the first few pages of a book to students in order to spike their interest and possibly add the book to their to-be-read list. We can hand them a book on the last day of school. Last year, our team purchased a brand new book for every child on our team in order for them to bookshop on the last day of school. This was our way of thanking them for a great year and also providing them with one more opportunity to read a great book. I wrote more about the process here, which we will be repeating again this year. We can provide ideas for great summer reading experiences to those at home. Last year, I wrote this blog post detailing ideas for how to create joyful reading experiences at home. This year, I plan on sharing it out again with those at home in case they need ideas. We can share the data on summer slide. I think discussing with students why summer reading is so important is a vital component of trying to motivate them to read. A lot of our students have grown so much this year and as the year winds down we recognize that growth and then also remind them that it would be a shame if some of that growth was lost. We can email or send home their to-be-read list. We always have students either take a picture of their to-be-read list and email it home to themselves and caregivers/parents, or make a copy of it and bring that home. We know that their notebooks get lost, some intentionally, some not, and so we don’t want this great list that they have curated all year to be for naught. We can share our own to-be-read list and our reading. I love sharing my summer reading plans with students because I know exactly the types of books I want to read; amazing professional development books that will shape my teaching as well as can’t put down YA novels. I show them pictures of the piles of books waiting for me and I continue to use my Instagram account to recommend books (#PernilleRecommends), while this account is not solely for my students, many do follow me which then provides another way for me to send a recommendation their way. There are other great ideas being shared on Twitter and in our Passionate Readers Facebook group such as holding voluntary book clubs over the summer, summer check out from our classroom libraries, and even hand delivering books to kids in their neighborhoods throughout the summer. I know many schools who have summer reading lists with attached work for students, particularly teenagers, yet the rebel in me cannot help but question this; how is it our right to dictate what happens over their summer break even with our best intentions? This is why we start to discuss summer reading already in the fall, because it is not enough to think about it the final weeks of the year. We know that reading gets a lot of competition when students are not with us and so we try to develop a meaningful relationship with reading all year long in order for students to have some sliver of intrinsic motivation to pick up a book outside of the school day. We ground this work in them reflecting and developing their specific reading identity, sometimes it works, and sometimes it is still not enough. Yet for every book talk, for every book passed into their hands, for every enticing read shared with them, we hope that this year will be the year more kids read over the summer, that more kids find a book or more to help them grow, that this year will have mattered as they leave us. PS: In case, you missed the announcement, I am running a book study of my first book Passionate Learners this summer in the Passionate Readers Facebook group. You should join us! Last week, we kicked off our second and final round of book clubs for the year. As I shared the titles for this round of book clubs, I was asked a lot of implementation questions. What do they look like? What do kids do? How do you make them successful? And while I have been referring people back to this post that discusses the changes that we have implemented through the years, I thought it might be nice for a comprehensive post that shares the how and why of what we do. Where do book clubs fit in for us? This graph may help with our layoot for the year. While I love doing book clubs, I will not do more than two of them in a year, our students ask us for moderation in everything we do and so two is enough in order for them to have other experiences with books as well. Of course, students may choose to run their own book clubs at any point, but they are not required to discuss their books like this except for these two times. Having a gap in the book clubs allows us to continue our all-year focus on joyful independent reading, as well as see their growth. Since we start out the year by focusing on their independent reading and then slip into a read aloud for the Global Read Aloud we have done a lot of work with establishing our overall reading community. This helps a lot when I need students to work independently either reading or discussion while I am coaching other students in our team area. Five minute word study (a root word exploration required by our district). 10-20 minute mini-lesson, it becomes about 10 minutes once we have read aloud our anchor mentor text – a short story that I found in the brilliant book Unbroken – 13 Stories Starring Disabled Teens edited by Marieke Nijkamp. Then 20 to 30 minutes is reading time for the groups. They can also choose to discuss in their group, I require they discuss in front of a teacher once a week. After our bell break, we usually finish with book clubs and switch to our writing work for 45 minutes. We will be kicking off our This I Believe writing unit next week that fits in nicely with our book club theme. The number one purpose of book clubs for us is for students to engage in meaningful discussions, that are rooted in their chosen books but not confined by them. We really want students to feel like they are honing their voices, continuing to carve out their ideas and thoughts on the world, and also find others to share their thoughts with. This community piece is huge for us, which is why there is very limited written work associated with their time in book clubs. The book club experience needs to protect their reading identity. The book club experience needs to be worth their time. The book club experience needs to give them opportunities for authentic, non-teacher directed conversations. The book club experience needs to help them grow as readers, thinkers, and human beings. The book club experience needs to be accessible to all types of readers. It is not just meant for the chosen few. We want to make sure at all times that these guidelines are honored in order to protect the reading community we have painstakingly built together. This means that we check in with these guidelines before we implement anything. This also means that the skills they are assessed on are directly tied into their discussions and not to any written work, unless they choose this. The rubric for their discussions can be viewed here. If a student does not do well in discussion or would rather be assessed through writing, we give them the option to do this one-pager created by my fantastic colleague Liz. We also have a few kids where they are doing the one-pager and discussing with an adult instead of with a group because of extenuating circumstances. However, we try our very best to give ALL kids the same experience, even if we provide more support for some of them in order to be successful. Often, kids who are labeled as below grade level readers will not be exposed to the same reading experiences and opportunities as their peers, because we worry that they will not be able to do it, however, when we remove even the opportunity for them to try then we may end up limiting their future growth. How can you ever be successful in discussions if you have never been expected to do one? Central to the experience is, of course, the choice of books. While our first book club of the year is centered around Dystopian Science Fiction (which the students loved), this second round is centered on the theme overcoming obstacles. Because this is a broad theme it has allowed us to bring in all types of formats of books, as well as honor many different reading accessibility points. We, therefore, have more than 40 books to choose from. These include many genres such as realistic fiction, fantasy, science fiction, historical fiction. It also includes different formats beyond the regular chapter books such as free verse novels, graphic novels, and audio books. While all students are expected to read at least one book in the three or so week span that clubs last, we also have groups who choose to read an entire series. They then engage in across series comparison work. One trick then is to make sure that they slow down enough to think deeply across the books and not just skim through the pages. To see our book club choices, please view the slide show. Note: this is updated and I keep updating it so if you want to remember these choices, I would encourage you to make a copy for yourself. One thing, we are asked a lot is how do you have so many books? There are a few factors at play here. One, my district, Oregon School District, believes in the power of funding books. This is why we have a beautiful school library and classroom libraries. We have a well-curated book room that continues to grow and expand as we add more titles, we tend to add groups of 5 to 10 titles in order to have a lot of different books to offer rather than just a few. I also buy a lot of books, I wish it wasn’t that way, but I do. While I certainly buy many via traditional means, I also use Books4School and Scholastic to help supplement our collection. Because our book clubs are central components every year, we have been adding to our collection year after year and I don’t think that will stop any time soon. We have a lot of different readers and need a lot of different books. Because choice and honoring who our students are as human beings is a central component, we knew we needed to offer students ways to be invested in who they are spending all of this time with, as well as the book(s) that they end up reading. This is why they have a central voice in who they are with. This starts with the partner interviews. This is a way for all students to reflect on who they are as a reader and what they need others to be in their groups. While many students naturally gravitate toward interviewing their friends, they often find that their friends’ reading habits do not match their own. They use this sheet to interview each other and then hand it in. For this later round of book clubs, students were given the opportunity to totally group themselves. We did discuss that they needed to be welcoming to all students and to base this off their reading habits, not just who they were friends with. All classes did a really nice job setting up their groups. All groups are kept to 3 or 4 students, with a rare exception for a partnership or a group of 5. We like the 3 to 4 people groups because it means everyone has an active role. We do not assign roles to members of the group because we see this as an artificial component of groups, that while it may be helpful when students first start out in book clubs in younger grades, really can end up changing the experience and not allowing them to fully express themselves they way we would like them to. No one in the group can have read the book or watched the movie. Everyone has to agree to rank it. For some of my voracious readers, there were not enough choices. We then enlist the help of our classroom library, school library, and our librarian in order to help them find something they want. This is also where I typically end up buying one or two other sets of books that then get added into our rotation. The group can choose to change their book before they even begin – we then show them what is left for them to choose from. The group can choose to abandon the book together within the first 3 days of reading. This is in case they don’t love it as much as they should. We want this experience to be awesome, not awful so book choice is vital. A student can choose to abandon their group within the first 3 days as well, if they really dislike the book or the dynamics are not working out for some reason. They then need to approach another group to ask if they can join them (with adult support) and then catch up to that group. If a group needs access to the audio version of the book in order for all kids to be successful, we then add the book to our Audible account. We don’t ever want the decoding of the words to stand in the way for a child to truly participate since the decoding is not what is being assessed. This also allows our kiddos who need extra support to be a part of these clubs without barriers that may harm their reading identity. Many groups also end up using Audible as a way to read together, thus enhancing the reading experience. And now they read and we start our mini-lessons. We always give them a few days to get into their book, during this time we do reminders of what we are looking for in powerful discussions, as well as have them do a main character baseline. Creating an anchor chart following our mini-lessons of what they can pay attention to when they are reading. Handing them a bookmark that also gives them things to discuss. They tape their reading plan to the back of it. I also pull small groups that need extra support with their discussions in order to help them find success. I stop discussions if they are not going well. If it is clear that a group is not prepared to discuss, I would rather pause them than keep them going. This means they get a chance to come back the following day once they have prepared. If it happens again, then they do their discussion ad we discuss what needs to happen the following week. Lots of post-its or note cards. This is the only time during the year where we require students take notes as they read. I do mini-lessons on what you can annotate for so that there is a deeper meaning to their notes and not just “…the teacher said I had to do it…” some students need more help than others. They cannot discuss if they do not have evidence pulled to support their thoughts. Discussion prep sheets. We have found that if we have students pick things they want to pay attention to and discuss the following week, their discussions are so much better. This graphic organizer changes as we see fit. Before they then discuss in front of us, we ask them what they are focused on this week and then hold them accountable for that. Partner feedback groups. I have written more about these in this blog post. After the first week, I pull them to discuss in front of me and then continue to do so every week. The first discussion is a formative discussion and then the following two are summative. I will write another post about what I am listening for if there is any interest in that. With the bustle of April and all of the excitement that that brings, the end of the year is fast approaching. But with that end also comes an inevitable beginning; a summer that calls for reflection, relaxation, re-invention, renewed commitment, and also the energy to try new things. I do so adore summer for all of its passion and courage, and also time to just be a reflective practitioner. 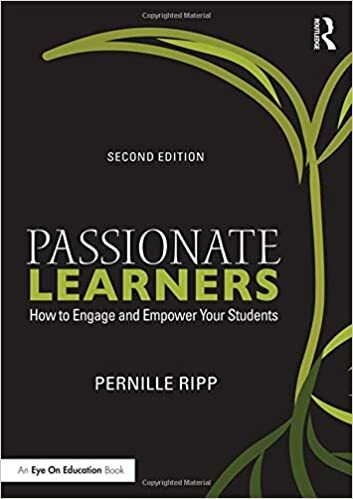 It is therefore that I am pretty excited to share that there will be a summer book study of my first book Passionate Learners – How to Engage and Empower Your Students , which will kick off on June 1st and run for four weeks until June 28th. Why June? Because while I am still in school in June, I am also itching for some reflection for the new year. And then comes July, where I take time off in order to be a better person and I hope others do as well. This book is what started it all, it reflects the journey I have been on, inspired by research and people who did the work before me, to create a more human and engaging experience for all of my students, particularly the kids who felt that school was not a place for them. The book is an honest view into what I did then and what I have learned from my students in order to be a better teacher for them while also working within the restrictions of a public school system. It is not meant as a step-by-step guide, but instead as a way for you to reflect on your own decisions and how you can change your teaching to allow room for your students to have more control and power over their learning experience. While the book study will take place in the Passionate Readers Facebook group, it is not a book focused on reading specifically, but rather overall student engagement. So join the Passionate Readers Facebook group for a casual and fun exploration of the book, find a community of your own that is trying some of the ideas, or have already implemented them into their classrooms. There will be reflective questions, helpful resources, Facebook Lives, as well as ideas shared in the hopes to make this school year the best one yet. Establish or expand a learning experience based around giving space for student voices. Be attentive to your students’ needs and share ownership of the classroom with them. Break out of the vicious cycle of punishment and reward to control student behavior. Use innovative and creative lesson plans to get your students to become more engaged and intellectually-invested learners, while still meeting your state standards. Limit homework and abandon traditional grading so that your students can make the most of their learning experiences without unnecessary stress. So if you are looking for a way to re-ignite your passion, to meet new amazing educators, and find great ideas for how to engage and empower your students, join this book club. There is no commitment once you join, pop in when you can and share when you want. Cost: Free – you do need a copy of the book, though, you can get your print or e-book copy of Passionate Learners here. Sign up: Please fill out the Google Form in order for me to email you all the details when we kick off. Don’t worry, I don’t use your email for anything else. Also, join the Passionate Readers Facebook Group in order to be a part of the discussion. Thank you for wanting to be a part of this conversation, I cannot wait for this opportunity to learn together! There is something about after spring break that feels like the end of the year is creeping up. As if the beginning of the last quarter is really the beginning of the end. As if, the days which were already rushing by are now flying so fast that it is hard to keep your wits about you. As the sun comes back – even as they call for more snow, as the days get longer, as the paperwork starts for the next year’s classes, we realize that the end of the year is coming whether we like it or not. Whether we are ready or not. So as the year starts to slowly unwind and I realize just how deeply I will miss this group of kids again, I am thinking of what I would still like to do. After all, there is so much still to be tried, still to be explored, still be built together. There is still so much to try and now is a great time to do a few things that will often leave a lasting impression. Now is a great time for another round of book clubs. We do two rounds in one year, more than that is overkill, less than that is a missed opportunity. These center around the theme of overcoming obstacles and allow us to channel the extra energy students bring in the lighter months into discussion. It also gives students a chance to sit with self-selected book people as they choose their next read together. I get to listen in on their conversations to see how they have grown and they get to show off their newfound knowledge as well as confidence when it comes to discussing texts. The last round finished in December so there has been a nice break between then and now. The choices in text they were given can be found here and if you would like to read more about book clubs, see this here. Now is a great time for more picture books. With state testing and other more high pressure learning opportunities we have been taking the last ten minutes of class to relish picture books, particularly funny ones. As we dive into our “Overcoming Obstacles” book club, which tend to deal with heavy topics, the humor from our picture books provide a nice balance and offer a great way to end our 90 minute block together. Now is a great time for surveys. I love tapping into the minds of students, after all that is pretty much the premise of all of the work I do, and right now they have some fantastic things to share if you only ask. And by fantastic I mean things that can help you grow. 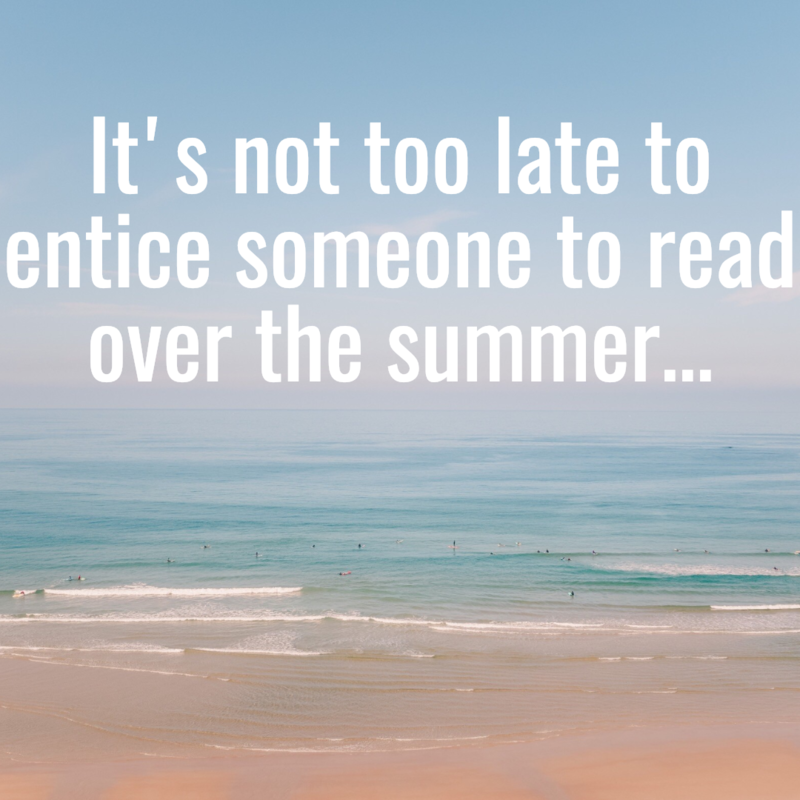 Now is a great time to ask whether they feel valued and respected, what their summer reading plans are, how you can better support them, and also what they would still like to learn. I recently did a beginning of the quarter survey and have been using their answers to guide my planning. In a few weeks, I will ask for their help in assessing the year; what should we have done more of, what should I never do again and such. The trust that we have hopefully built up really allows me to reflect on the past year and to have them help me think of the new one. These students are, after all, the best professional development I can receive. Now is a great time to plan for summer reading. While I would never require my students to read over the summer, after all, that falls far outside of my rights as their former teacher, I do want to encourage it with all of my might. This is why we have been talking about summer reading all year but now it really becomes a starting point. I try to ramp up conferences with students in order to help them sort through their habits as well as ask them point blank how they will keep reading throughout the summer when there is no teacher there to nag them. With more than 1/3 of my students reporting that they didn’t read a single book last summer, I am really hoping to help a few kids onto a better path. This means book talks, book shopping, and continuing to work on our to-be-read list until it gets emailed home that last week of school. Now is a great time to plan for a book giveaway on the last day of school. Last year, we planned a new event for the last day where we gave every single student on our team a brand new book. With the help of school funds and Books4school.com we were able to spend a few hundred dollars and provide 150+ kids with incredible choices for their summer reading. This was one more way we hoped to entice them to actually read over the summer and also meant as a parting gift for all of our students as a way to thank them for the year we had had together. However, pulling that many books together takes time and so now is a great time to start planning for that. Can you secure donations for books? Is there a way to get a brand new book into the hands of every child? Now is a great time for another read aloud. As we wind down together, there is something special about settling in with one last shared book. The last three weeks of school, we will crack open the pages of a final read aloud together to see how far we have come in our comprehension of text, but also just to continue to build community. Contenders in our classroom right now include The Bridge Home and Drums, Girls, and Dangerous Pie but I will also be asking students for suggestions to see what mood they are in. Now is a great plan to start thinking of summer check outs. I allow students to check out books from our classroom library every summer and so does our school library. For me it means checking out books and keeping track of them in the last week of school and then asking students to bring them back when school starts again. For our library it means having extended hours a few days for kids to check out, a few days open throughout summer, and then again asking them to bring back all books when the new year begins. While I inevitably lose a few books every summer, I also have a lot of students read more books because they finally get to check a great book out that they have been waiting for or can have an enticing pile to take home to hopefully tempt them . There is no reason for all of my books to just sit on my shelf all summer when they could be in the hands of readers. Now is a great time for more free writing. Many of our students have been asking for more creative writing and so we have been making time for this as well. Using prompts from The Creativity Project, John Spencer, or student generated, students take 10 minutes most days to either write about the prompt or continue their own story. They then share with those they would like to share with. It has been a really wonderful way to reclaim the joy of writing as students continue to work on who they are as writers. Now is a great time for more discussion. I don’t know about your students, but ours are chatty! And while I love a fun class, it can also be exhausting to constantly try to get them to settle into more quiet activities, instead we plan for more discussion-based explorations such as book clubs, as well as our heated topic debates. Rather than continue to fight their voices, we plan on channeling their voices for productive means, much like we have throughout the year. Now is a great time to have some fun. Because the days are winding down, because the sun is coming back, because these kids won’t be ours much longer, now is a great time to just relax and have some fun. We teach the age group we teach because we love them (hopefully) and I don’t want to forget that. While 7th graders can be a challenge, they are an incredible challenge to have, and one that I wouldn’t trade for much in the world. why not embrace it? enjoy it? And have some fun these final days together. For many years, I was so thankful for the power of BYOD. Working in schools that didn’t have the capital needed to provide chrome-books or other computers for easy access to all, BYOD – or bring your on device – was a game changer. We could take pictures, film video, search up things and connect with the world. A few years ago as Chromebook slowly increased in quantity, I started to notice a trend with the way phones were being used in our school. While it wasn’t so much that they were used during class, after all, most students were engaged most of the time, it was more that the minute someone screwed up, which inevitably happens often in middle school, there was a device out to record it. To share it, to snap it, to make sure that everyone who was not present now had a front seat. And its effects showed. Our students started taking less risks, afraid that someone would film them. Afraid that the world would know of their mistakes rather than their attempts at success. Anxiety went up, social interaction went down. I started to pay attention to my own phone habits, how my world seemed to be ruled more by notifications and interactions with people far away, rather than the life that was happening right within my reach. Digging into the research surrounding anxiety and the presence of phones, proved to be eye opening. While there are many benefits to the connectivity of phones, the noted increase in mental health related issues could also not be dismissed. At what cost, was our connectivity and the ease of BYOD causing our students anguish? And so, we did an experiment. We took a quarter off from our phones in class, me included, and we waited to see what would happen. I wrote more about here in this initial post explaining our thinking and then as a follow up to how it went. It was eye opening but also anti-climactic. Many kids reported it was no big deal, that they were fine without their phones, they didn’t miss them, we didn’t need them because we had the privilege of having enough technology at our fingertips that didn’t require students to have their phones. A few kids grumbled, these were often the kids who were less engaged and more prone to use social media during class. And then there were the few; the kids were it made a huge difference. The ones that reported that they finally felt safe in our classroom. The one that told us of how they had realized that they were constantly checking their phone for fear of missing out and that they hadn’t realized how much time it took. The ones that appreciated how people seemed more present, less worried, more there. I was not the only experimenting with this and the results were similar in other classrooms as well. And so as a staff, we started to discuss whether this should be a school-wide policy: ask students (and staff members) to leave their cell phones in their lockers from bell to bell in order to provide a safer learning experience, an experience that focused on meaningful technology integration, and also an experience that allowed them a larger opportunity for face-to-face connections, particularly during their lunch and recess time where we often saw kids have little to no interaction with those surrounding them because they were too busy using their phones. And while I am not one to dismiss the power of interactions between people using social media or gaming, we wanted them to have a chance to also interact live and face-to-face. After voting, we implemented it for this school year. As I have had visitors come and see our classroom, they have asked about our noticeable lack of phones everywhere. And I have been asked to write more about it, thus this post. So today, I asked all of my students to give me the honest truth; how does it affect them to be phone-free at their school? Are they missing out since this seems to be a major discussion point in the phone or no phone debate? Are we doing them a disservice by not embracing the tool and teaching them how to use it well? Their answers were enlightening. While most of my students own a phone, a few don’t, reporting everything from cost prohibitions to no desire to own one as the reason why. This led me to think of the equity aspect of expecting kids to all have a phone. 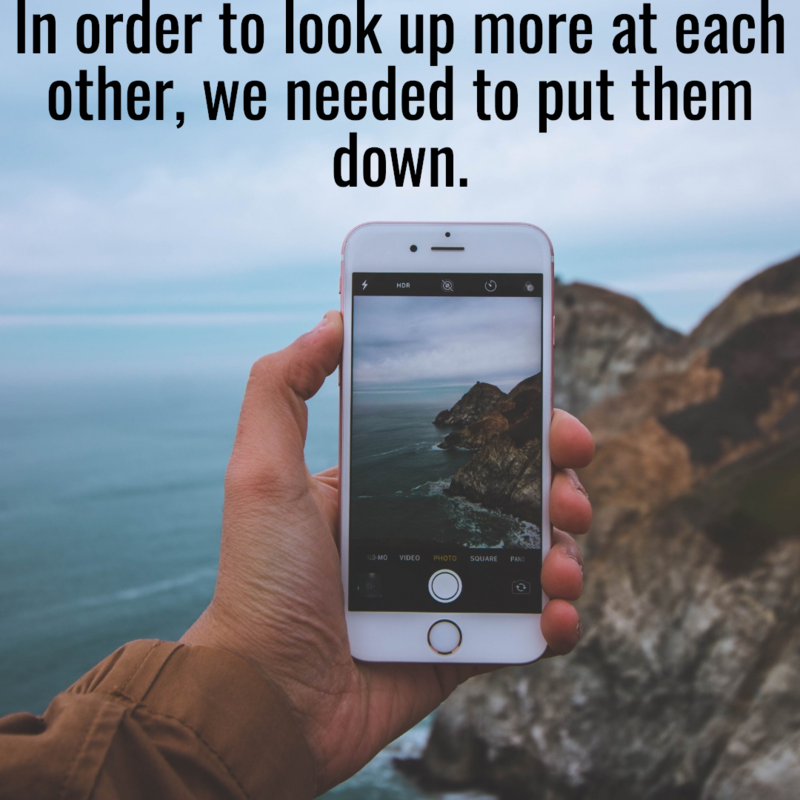 Not every family can afford one, not every family wants to provide one to their child, yet when we assume that all students have a phone and then base our instructional experiences around using them, we are creating a noticeable gap between students that may lead to tension and awkwardness in the classroom. As one students said, sure, I could just use a Chromebook but that still makes me stand out and look different than the rest and that can be embarrassing. I asked my students whether they cared about lack of access to their phones. Overwhelmingly they reported that it wasn’t a big deal, that they didn’t feel they needed them. That, sure, they would love to have them, but that they were not missing out on any educational opportunity in their eyes. I am not saying that phones can’t be used for amazing things, but in this case, the students didn’t see that. In fact, it was interesting to see how many students who did want their phones also reported that they would only use them for Instagram, Snapchat, and texting if they had them, nothing else. A few reported wanting to use them as calculators or to search up words. Not exactly deep reasons to bring them back as we can do all that with other tools provided for us. Another point often brought up is that we should be teaching students how to use their phones well. that much like all of the other tools the world has introduced us to, phones should now be a part of the school experience so that kids can use them well. I am not sure about this point. While I agree that as educators we adapt our curriculum to face the modern construct, I wonder whether the responsibility of teaching students how to use their phone well should fall on us? Should that not fall on those who provide the tool? That doesn’t mean that it can’t be supplemented in school, but I am not sure the main responsibility starts with us. And what is it exactly we can only do on phones that we cannot do with a Chromebook or iPad? A few things come to mind, and perhaps I simply don’t know enough about the amazing things phones are being used for, but I am not sure it is enough to warrant the blanket blessing of phones without thinking about the potential for increased anxiety, bullying, and overall distractibility that these powerful computers can also bring with them, even for the adults. As I scanned through all of their responses, what really stood out to me was one common thread; that they wish they could have their phones in case “something bad happened.” That a major reason for why they wish to have their phones is in case of an emergency. Think about that for a moment. Our students don’t always feel safe at school, perhaps now more than ever, and so they see their phones as a lifeline to get help. It shook me to the core, because of course, I feel the same way; I need my phone in case something bad happens, but to hear it repeated again and again from 7th graders was startling. And so we will continue to be cell-phone free for now. We will continue to ask students to leave them in their lockers so that we can be together. I will continue to leave my phone in my bag unless I need it for a specific purpose. To be more present, to think of the technology opportunities kids do have in order for us to connect, to become more than we were. Does this mean that phones in schools are bad or should never be there? No, it just means that for us, the learning experience we have right now, it makes sense to be cell phone free. That we have seen less phone-related anxiety and stress. We have seen less drama due to kids being filmed or ridiculed when they should have been safe in our classrooms. That we have been more thoughtful when we did bring out devices. I share this in order to start a conversation, to perhaps plant a seed for others to explore within their own learning communities. Not to dismiss the power of technology, nor the power of what can happen when we connect with others. But as someone who knows the anxiety that a phone can produce, who is “one of those parents” that is holding off on getting a phone for her own kids, I think it is valid to have these discussions. That often in our eagerness to embrace technology, we forget about the mental health impact more technology and how it is used can have. That sometimes when we bring in more devices it traps our students rather than frees them, and that is not something to easily dismiss. I would love to hear your thoughts. If I asked most of my students, they would consider me a great teacher for them. They would tell you how safe they feel in our classroom, how they feel respected, how they feel like what we do is worth their time. It is easy feeling like a great teacher if those are the only voices you pay attention to. But if you were to speak to a few, perhaps the ones who would need some extra goading, perhaps those who choose to remain mostly silent throughout our time together, a different story would emerge. They still hate English, they still hate reading and writing, they find little value in what we do, and some, probably, also see little value in me. I don’t think I am alone in that. Our schools are filled with both kids who flourish and those who don’t. Those who see the value added to their lives in what we do and those who don’t. Those whose days consist of success and those who have limited success. But whose voices are being heard in our conversations? Whose voices are shared in assemblies? Whose voices are shared when we invite incoming families in to discuss what a school experience consists of with us? And what happens when we don’t monitor whose voices get the most space within our school? When we once again select the few kids that we know will speak up, speak eloquently, and will stick to the message that we know reflects us best? It means that we create a false sense of accomplishment, as if student voice is something we can checkoff, as if everything we do is exactly right and all we need to do is just stay the course. I worry about the echo-chamber we sometimes create, whether inadvertently or purposefully. How many of us purport to support student voice but then only give the biggest space to those we know will shine a positive light. How we assume that a child must view their schooling as favorable as long as their scores, grades, percentages show them as successful. How we squelch the voices of those who may have less than stellar experiences to share. How we dismiss their voices as simply kids carrying a grudge, or not understanding, or simply just being in a tough spot. How easily we dismiss their experiences rather than recognizing them for the incredible learning opportunity they are. A chance to dive into what we still need to work on, a chance to create a partnership with those whose experiences are not successful despite our carefully laid plans and best intentions. When I ask others to make space for students to reclaim their voices, I don’t just mean those whose voices echo our own sentiments. I don’t just mean those who will present us in the best of lights. All means all and that includes those who will tell us the unguarded truth even when the truth hurts. This is why in all of my presentations there is truth that hurts, statements that made me grow, that felt like failures when I first was given them. It is important to model to others what real feedback looks like, to acknowledge that at times we will fail our students. That at times we will not be the teacher, or the school, or the district that they needed us to be and we now have to figure out how we can do better, with them. Because that is what the truth does; it gives us a chance to grow. To become something more than we were before, but we cannot do that if we only make space for those voices who will tell us all of the good we are doing without mentioning the bad. If we only select a few to represent the many without giving everyone a proper chance to speak up, to be heard, to shape their experience. So survey all of the kids. Give space to all of the kids. When students are invited to speak at your training events, at your staff meetings, at your school board meetings, invite a broad range of perspective. Sure, invite those kids in where the system is clearly working, but also invite those who tell us through their behavior that it’s not. Who perhaps may be doing well but who really do not love it. Monitor who you give space to so that all experiences can be represented because if you don’t then it is really just a sham representation. And then ask meaningful questions, not just those where students will provide you with sound-bytes that will do little to move the conversation along. Ask them if they feel respected. Ask them if they feel valued. Ask them if they feel represented. Ask them if what we do matters. Ask them how by working together we can make it better. And then listen to their voices, all of them, and instead of dismissing their words take them for what they are; the biggest gift to do better, to be better. An invitation to create an education that matters to all, not just some, and who can say no to that? If you are wondering where I will be in the coming year or would like to have me speak, please see this page. If you like what you read here, consider reading my book, Passionate Readers – The Art of Reaching and Engaging Every Child. This book focuses on the five keys we can implement into any reading community to strengthen student reading experiences, even within the 45 minute English block. If you are looking for solutions and ideas for how to re-engage all of your students consider reading my very first book Passionate Learners – How to Engage and Empower Your Students.